Elisa Shoenberger (@Vogontroubadour) is a senior prospect management and research analyst at Loyola University Chicago. Recently, I had a rather frustrating research experience. I was working on the profile for a corporate foundation and spent a lot of time slicing and dicing the giving, analyzing the board members and much more. When I was about to finish the profile, I decided to look at the most recent Form 990 for the foundation—and had a bit of a shock. There was a note in the middle of the form about a decision to defund the foundation. Yep, all that work on the foundation and it was going away. I ended up spending another couple of hours integrating that new information into my profile. So what did I learn? What have I always known? Always read the Form 990. So I’m going to offer tips about using the Form 990 for people who are unfamiliar with corporate and foundation research. First and foremost, what is the Form 990? It is a U.S. federal tax form for organizations that are exempt from income tax. This form has a lot of important information on it, including the fair market value of assets, yearly contributions made to charities, how much money an organization gets in donations, board members and, my personal favorite, grants. One important note: Corporations will not have the Form 990. Their corporate foundations will file them, but corporate giving programs are not separate legal entities and do not have separate filings. Per Grant Space, “They are not subject to laws governing exempt organizations, including public disclosure requirements.” Corporations might have financial statements if they are publicly owned—if a company is private, you may have to rely on secondary sources to find information contained in a Form 990, like newspaper articles and profiles. There are several websites that collect 990 forms. National Center for Charitable Statistics has many years’ worth of forms and is free with no login required. Guidestar is handy and also free, but you have to sign up and it only includes three years of forms. Paid resources like Foundation Search or Foundation Center often have more than three years of forms. Sometimes a foundation website will include 990 forms or a list of grants, but it is not required. 1. Check out the fair market value of assets. Check out total assets for the end of year. This is an important figure to track. I usually look at three years of forms whenever I do a profile. This value can tell you a lot. One thing that urged me to look more closely at the Form 990 I mentioned at the beginning of this post was because the foundation went from having millions in its assets to about $100,000 in a year. This could mean a foundation is winding down. Then again, some foundations will get influxes of money each year to give away that surpass the value of their assets. 2. Observe the contributions made or grants and similar amounts paid. This amount is the total amount that the foundation gave in the past year to nonprofits. This is key to any profile—foundations are required to give 5 percent of their assets. Some foundations give a lot more than that while others stick to the minimum. 3. Note the total expenditures or Total Expenses. This will include any operating costs of the foundation (like salary) and the contributions. 4. Look at the contributions made to the foundation or contributions and grants. Sometimes the foundation will be sustained by its own investments. Other times, foundations receive contributions from individuals or companies. 5. Evaluate the grants. This is crucial. You can see how much a foundation gave to an organization and where the organization is located. Sometimes there will be information about why the grant was given. Usually these are attached at the end of the Form 990. This is the heart of a profile—an organization may say it supports XYZ, the grants show what it really supports. 6. Look at the board of directors. 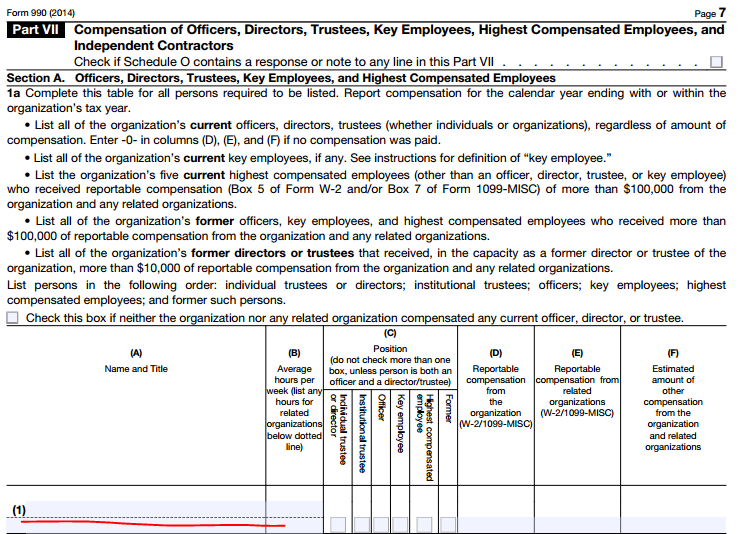 There should be a list of current directors on the Form 990. You might be able to find some useful connections for your organization. 7. Check the recent Form 990 for any declarations, resolutions or other legal documents. As I explained above, there may be resolutions or other documents nestled in the middle of the foundation’s Form 990. These documents often include critical pieces of information about the foundation’s work.